This photo was taken over Christmas at my grandparent's house. Not happy with my own presents, I had seized my cousin's rainbow umbrella and started performing "Singing In The Rain," from one of my favorite movies as a kid. I grew up in a wonderfully accepting, progressive home, and my parents have almost always been fantastically supportive of who I am. But bullying at school was a daily reality for me growing up, and there were many times when I ended up in tears. I came out in college and it was without a doubt one of the most liberating experiences of my life. Yes, it caused some pain at first, but that faded. The freedom I felt did not. Unfortunately, I did grow up in a culture that is possibly still globally synonymous with racism and intolerance. The prevailing opinion in my community was it's better to date a white man rather than a black woman. Either way, there's not much acceptance going on. But ultimately, I’m grateful for these struggles. They forced me to become a better person, more tolerant, and understanding of people different from me. I have learned that being different is the most fantastic gift. It makes you more confident in who you are, as there is just nowhere for you to hide, anyway. 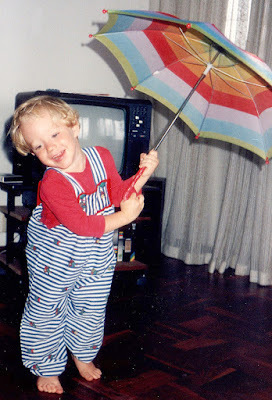 If you want to dance around with a rainbow umbrella, GO FOR IT! People might laugh with you or at you. Either way, laughter is always good!